The Bullock Texas State History Museum. Courtesy of the museum website. 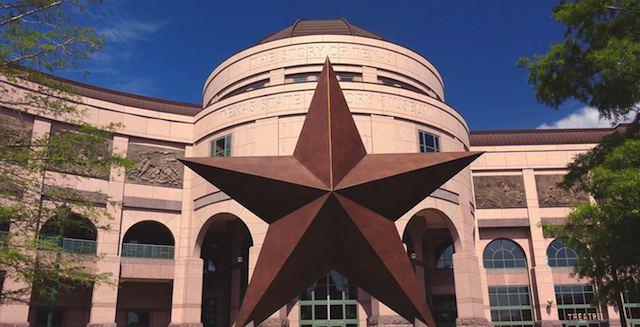 As a native Texan with a degree in history from UT I’m probably a little biased in this area, but my favorite history museum is The Bullock Texas State History Museum. Not only is the building itself beautiful, but I like the way the history displays are laid out on the inside. Starting with the first floor, you start with the earliest inhabitants of the state of Texas, and work your way to the present day on the second and third floors. The original Goddess of Liberty statue from the top of the Capitol dome is also on permanent display there, although a part of me wishes it was still on the UT campus at the Texas Memorial Museum. The rotating exhibits on the first floor are also always very interesting. Several years back I remember going to see a temporary display there of historic Texas flags there which kept me mesmerized for the better part of three hours in that one room.